Today’s post is all about Istria, a little-known peninsula in Croatia where visitors can go to escape the crowds and enjoy an authentic Croatian experience. Tea, the blogger behind Culture Tourist, is here to share why you should spend a weekend in Istria! Croatia is quickly becoming one of the most popular holiday destinations in the world. 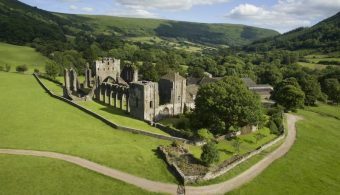 The country welcomed 18.5 million visitors in 2017 and it’s likely that number will continue to rise. Many tourists will visit Croatia as cruise passengers and will see the beautiful but over-crowded ports such as Dubrovnik and Split. But if you’d like to discover a quieter, hidden gem in Croatia to get away from the crowds and find a more authentic and relaxing holiday experience then keep reading to find out more about Istria. While Rovinj is a popular cruise spot in Istria, there other quieter areas to discover a slower pace of life. Istria is Croatia’s largest peninsula in the southwest and is one of the most beautiful parts of the country and has strong Italian influences thanks to its proximity to the Italian border. Both Croatian and Italian are the official languages and Istrian Italians are an ethnic group in the area. 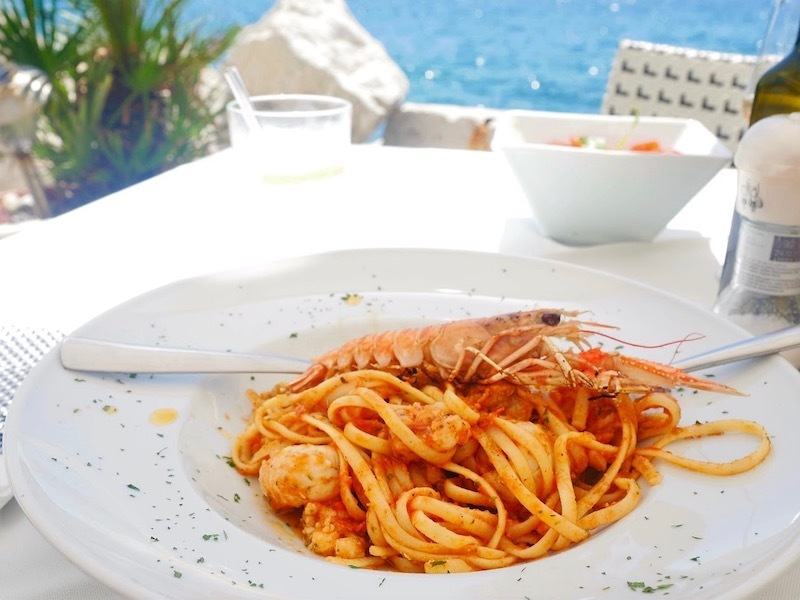 As you’d expect from both Italy and Croatia, Istria has a beautiful coast, many old historical towns and it’s famous for its great wines and Mediterranean cuisine. The best way to get to Istria is to fly to Pula, Zagreb or Venice. You’ll find many budget airlines flying to Pula but if Venice is a better option then you can rent a car and drive for 2 hours to Istria. We flew to Zagreb, the capital of Croatia, and rented a car from there. It took us just over two hours to arrive to Istria but it was so worth it because we’ve enjoyed the beautiful scenery along the way, and I would definitely do it again! 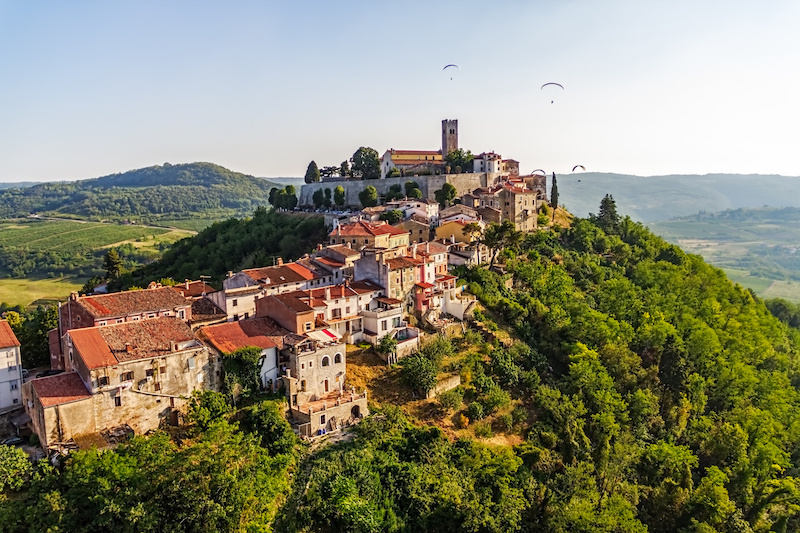 TIP: Rent a car – Istria is a home to so many beautiful places from the small medieval towns to local wineries. The easiest way to get around and see them all is with your own hire car. Roads are quite nice and there is a highway connecting all the major cities on the peninsula. You can rent a car at the airport or in a town where you’re going to stay. With so many cute little towns it could be hard to choose where to stay during your weekend in Istria. Pula is the biggest town in the region and it’s also where the airport is. Some of the larger places to consider are also Porec, Novigrad, Rovinj and Umag. If you would like to explore the region during your weekend in Istria, staying in Rovinj would be the best option. It’s centrally located and you could get anywhere in Istria from there within an hour. I really recommend staying at Hotel Eden. I started my trip in Rovinj, a cute old town that was inhabited before the Roman times. The old houses with colourful facades look like they haven’t changed at all throughout the centuries. It was built on a little hill, which was a once an island. We visited Saint Eufemia Church on the highest point of the hill. You’ll find Saint Eufemia’s statue at the top of the church tower, and it’s showing the direction the wind is blowing. Another interesting part of Rovinj is Grisia Street which goes all the way from the Saint Eufemia Church towards the old city gates. The narrow stone street is home to numerous art galleries and artist ateliers. Their paintings are displayed all over the street and it looks like an open art gallery. We dined at Puntulina local sea-front restaurants and we finished our day by enjoying our dinner while looking at a gorgeous sunset over the sea. I just love the blue transparent Adriatic sea! That’s why I started the next day by going to the beach and had a swim there. 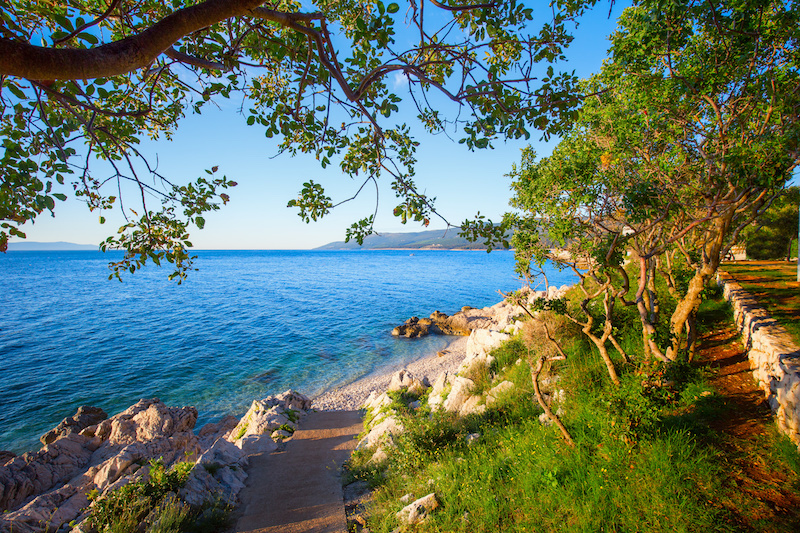 Croatian beaches are usually rocky and you won’t find many sandy ones so don’t forget to pack some beach shoes! If you’re visiting in the colder months then I’d recommend visiting Zlatni Rt, a beautiful forest park next to the beach in Rovinj. A walk around this park would be a nice alternative to swimming if it’s too chilly for a dip. After a relaxed morning, we had a lunch at one Maestral Restaurant. There are so many delicious seafood restaurants to choose from and my favourite dish was grilled sardines with bread and tomato salad. It might be tempting to spend most of your time around the coast of Istria but there is plenty to see inland too. We spent our Saturday afternoon exploring some of the small towns located on the top of the hills. One of the Istrian legends says that many years ago, giants used to live in this area. Veli Jože (Big Joseph) is the most famous legend and you’ll find many restaurants named after him in Istria. According to the legend, those giants built all of those cities, by putting the stones at the top of the hills. The most famous among the towns is Motovun. It’s an old Medieval town with two rings of defensive walls. Having a walk around them while enjoying the view to the surrounding area, little hills of Istria and numerous vineyards on them, is definitely a must. Each July, one of the most famous Croatian film festivals is organised there and you can watch movies in the open air cinema at the main square. We had to leave our car at the bottom of the hill and took a small bus to take us all the way up. It’s a short five minutes ride, but you can also choose to walk there. We also visited nearby Grožnjan, known as the Town of Artists. Grožnjan had many abandoned houses so in the 1960s the Croatian government gave the empty houses to local artists who opened up their homes and studios to the public. their studios, and it became a real town-gallery today. There is a lovely restaurant called Konoba Pintur in the main square where we had some pljukanci, a local pasta dish, very popular in Istria. Istria is well known for its truffles and you can’t miss trying them in the local restaurants (often served with pasta). If you would like to learn more about Istria’s truffles then by sure to visit the most well-known producer, the Zigante family who can be found in Livade village. We’ve skipped it this time, but would definitely pay them a visit when next time in Istria. However, the thing we didn’t skip was trying some Istrian wines. The most famous wine from this region is Malvasia (malvazija in Croatian). We stopped at San Tommaso, one of the local vineries on our way back to Rovinj and bought a bottle of wine there. You’ll find many wineries around Istria and you’ll often find the owners will organise an informal wine tastings for their visitors. It’s such a lovely way to meet some locals and learn about the local life. Woken up by a beautiful sunny morning and clear blue skies, we finished our weekend in Istria in Pula, Istria’s largest city. Pula was a Roman city and you can still see the remains of the Roman rule on every single corner. One of the best preserved Roman amphitheatres, called Arena, is there. We have went inside and joined one of the ‘Gladiators’ games’. I was stunned by the small hallways gladiators were walking through before they would come to arena to fight. Other Roman sites to look out for are an old Roman theatre, triumphal arch and finally a temple at the old Forum. We went for a lunch at Piazza Nove and once again enjoyed in a local cuisine. Again, grilled fish with some fresh salad was what I went for. After lunch we visited the Olive Oil Museum. In the small museum we learned about some local olive sorts. I was quite surprised to learn that, like there different grapes for different wines, there are different sorts of olives, too. We’ve also bought some local olive oil and have took it as a souvenir from Istria back home with us. Sadly, it was time to go back home already. So, after some nice and refreshing lemonade in one of the local cafes, we went to the airport. Croatia is a wonderful destination to visit and a weekend in Istria is definitely worth considering. Rt Kamenjak – This is a nature park located at the very south of Istria where you can enjoy the nature and beautiful beaches. Pore – Small town with many nice restaurants, cafes and local shops in its centre. It’s quite famous for its Euphrasian Basilica, that’s under the protection of UNESCO and a must see when in Pore?. Umag –This is where the biggest tennis tournament in Croatia is held. There are many public statues dedicated to tennis and there are nice beaches around it too. Novigrad – It’s a smaller town, but one of my favourites in Istria. You can still see its old city walls and you can actually swim just next to them. It’s old stone houses looks like they’re there for centuries. Tea Gudek Snajdar is an Amsterdam based travel blogger behind the www.culturetourist.com. Originally from Croatia, she writes about art and culture in European destinations. 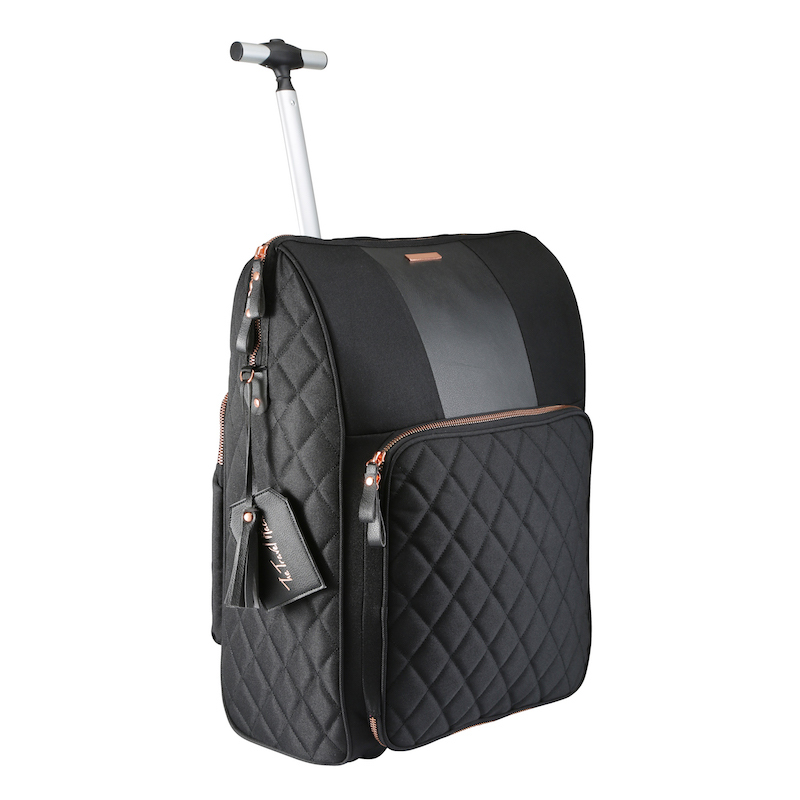 When travelling she likes to visit museums, local art and design shops and chat with local people. She also organises private art tours in some museums in Amsterdam (https://culturetourist.com/tours/), and creates colouring postcards within her project ‘Drawing the art of Europe’ (https://www.etsy.com/shop/CultureTourist). 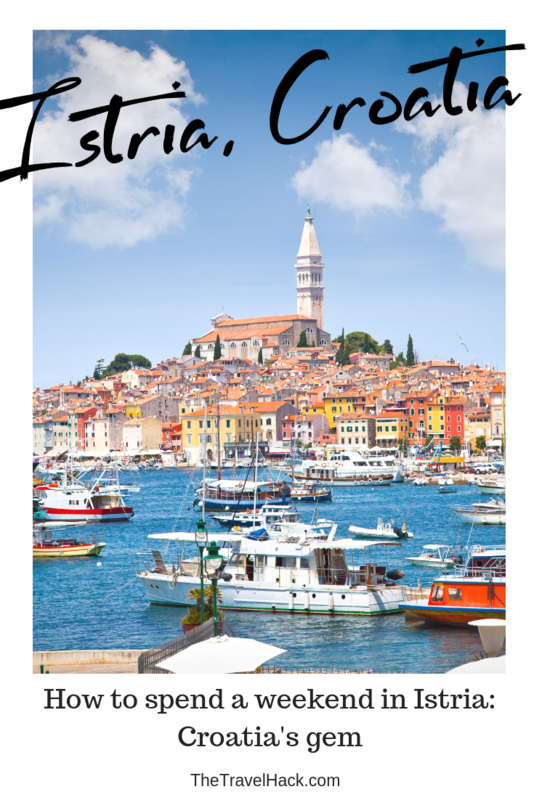 We are heading to Istria this summer as part of a 6 week family sabbatical so I really enjoyed reading this, thank you SO MUCH for the great tips. We haven’t done any research yet so this was so helpful! !